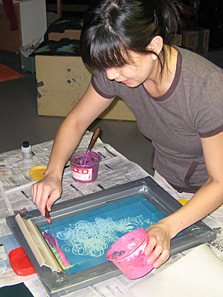 The process is called Silkscreen printing. I come up with an illustration that is black-only. Ideally, the graphic is a vector image so that it's as crisp as possible — I do most of my work in Adobe Illustrator. I have the design printed on clear acetate. I buy my own canvas stretchers and nylon from an art store. Back in the day, they used real silk, but these days, it's just nylon in various grades. Building silkscreens is similar to stretching canvasses for paintings, but then I also cover up the frame parts with duct tape so that, later on, I can keep ink and water out of the frame area. Once the screen is built, I coat it with a photo-sensitive emulsion on both sides of the screen and then let it dry for 24 hours. Application and drying of this emulsion has to happen in a darkroom, since it is light-sensitive. So no pics of this, since it all happened in near blackness! 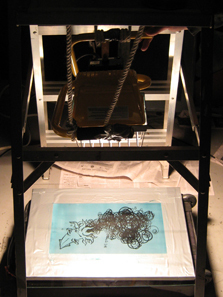 Once the emulsion is dry, I place the screen on top of black material to remove any chance of light reflecting anywhere. With the screen flat side up (ie. the side where the nylon is OVER the frame, rather than tucked into it), I place the acetate with the artwork on top of it and make sure that it's BACKWARDS. This is because this flat side of the screen is the side that will be against the shirt/tote during printing, so it's the mirror image of what will actually print. I put a sheet of glass overtop the acetate/screen so that everything stays in place. I used a water-based ink and I just buy some basic colours — black, white, and then light and dark versions of the primaries (red, yellow and blue). All the colours I use on the shirts are mixed from these. As well, I happen to use gradients for all my prints; this means that mix two different colours/shades and print the graphic so that it fades from one to the other (ie. aqua-to-lime, or rust-to-orange, etc). It makes for some challenging printing, but I like the effects. For this particular example of the squid, I mixed up some hot pink and some plum. 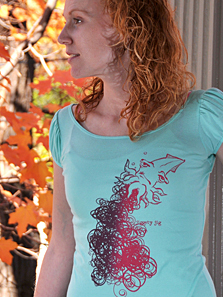 I also add a catalyst to the ink, which guarantees the inks' permanence on the fabric. The shirts should be put on stretchers before being printed. Whoever is helping me that day puts the shirts one by one on large boards so that the fabric is somewhat taut. I put a 'bead' of ink along the top of the concave side of the screen, on the top side of the graphic — pink on the left, plum on the right. Where they will meet in the middle, I stir them together a little so that the gradient is less sudden. We do a couple of tests on paper first, just to make sure everything looks ok, and also so that the gradient becomes more gradual. When printing on the shirt, I place the screen where I want for the imprint to land, and my helper holds it firmly in place. With a squeegee, I pull the ink towards me over the graphic. Where the emulsion from step #2 washed out, the ink passes through the screen and onto the fabric below. In this case, I would do two pulls per shirt. For shirts where the ink is lighter than the fabric, I typically do three pulls; this is because the colours are transparent, but with the more opaque white in the mix, it can still show up on the fabric, though it just takes a little more ink to do so. The shirts take a couple of hours to be dry enough to pack up. The only thing left to do at this point is to iron them. This is actually not a ‘necessary’ step in the process because the catalyst I added should ensure colour-fastness... but I like to be extra certain, so I do iron each and every imprint just to make sure. I have been wearing a couple of my shirts for over a year and a half now, and even after dozens of washings, they still look great... so why mess with the process? And so there you have it! If you ever wondered how an m chen wear came to be, you know now!